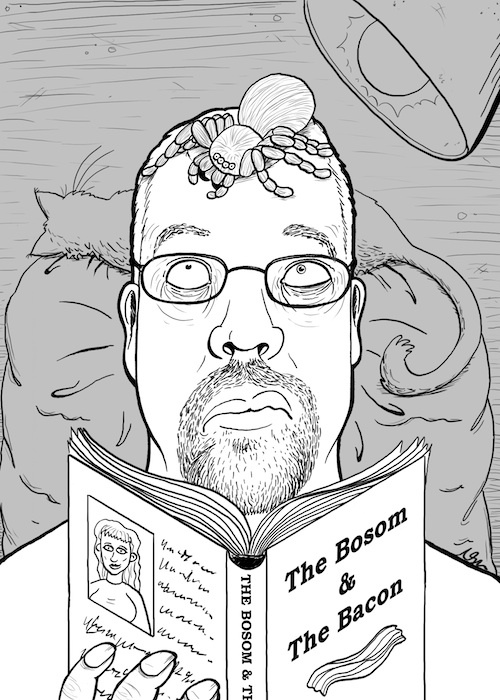 Spider on My Head: Day 6 | Kris Johnson's Blog…sort of. In the nearly nine years they’ve been living at the International House of Johnson, Rosencrantz and Guildenstern have not proven to be especially effective spider hunters; they are, at best, inconsistent. I can recall one occasion when one of the cats (Rosie, I believe) cornered a spider and “played” with the arachnid until it expired. There was a rather unenthusiastic attempt at consuming the recently-deceased, but apparently spiders don’t taste very good and I ultimately had to dispose of the corpse myself. Since that day, I’ve seen eight-legged intruders trundle across the floor inches away from one cat or the other, in full view and yet completely ignored. It should come as no surprise, then, that the cat sleeping behind me in today’s illustration displays nary a hint of the predator-prey instinct, nor any sort of compulsion to protect its master from enormous, hideously-befanged arachnid horror. Art by Natalie Metzger (AKA, The Fuzzy Slug). Click to embiggenize. FUN FACT: I can only assume that The Bosom & The Bacon (a) was written by Jane Austen, is (b) an immediate sequel to Pride & Prejudice , and (c) features Mr. Darcy and Elizabeth Bennet Darcy in a rather ribald kitchen scene that at least partially inspired the film 9 1/2 Weeks . I would totally read this novel. In hardcover. Twice. I have been very bad about reading blogs, even the ones I have been subscribed to forever… the spider caught my eye on Google Reader however. I forgot how much you make me laugh, dear sir. Thanks!